March 15, 2011 - When Tampa International Airport (TPA) shut down its primary runway in early January to repaint the numeric designators at each end, and change the taxiway signage, the reason for the closure set off a maelstrom of press coverage. As a result of the movement of the magnetic north pole, runway 18R/36L no longer aligned along the 180-degree/0-degree north-south axis. When the runway reopened, it had been repainted 19R/1L to more accurately reflect its magnetic directions. More than 140 signs and panels had to be changed, as well as the painted numerals on the runways. 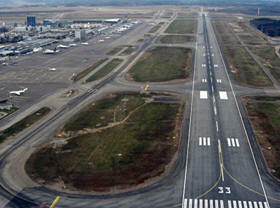 Later in the month, a lesser-used, parallel runway and an east-west runway were also changed. What the news media grabbed onto was something well known to pilots and navigators: the earth?s magnetic field is changing. Magnetic north is distinct from the geographic North Pole, of course, but magnetic north is proving to be an increasingly moving target. At the moment, it?s sliding across the Arctic Ocean near Canada toward Siberia at a rate of nearly 40 miles per year. According the U.S. Geological Survey, that speed has increased by 36 percent over the last 10 years. ?Adjustments to runways like this and to navigational aids are ongoing,? according the Kathleen Bergen, a spokeswoman for the FAA Southern Region. ?Every five years, the FAA reevaluates shifts in the pole?its magnetic variation?and makes changes to runways and flight procedures as needed,? she said. Mike Pound of Jeppesen noted that his company provides immediate updates to subscribers on airport changes, whether they are listed in databases, charts or approach plates. ?It?s an ongoing process for us but, to be perfectly honest, it?s also nothing new. Airports change their runway designators regularly.? The same change took place in 2009 at Palm Beach International Airport (PBI), and Miami International (MIA) corrected its north runway numbering when it was rebuilt in 2003. Mike Nonnemacher, director of operations at Fort Lauderdale International (FLL), says they plan to renumber their south runway during a 2014 expansion. The St. Petersburg-Clearwater International Airport (PIE) is scheduled for a change later this year. One reason for the flurry of re-paints in Florida is that the state lies on the agonic line through the United States, which is the line with no magnetic variation. The agonic line presently runs roughly from Florida through Lakes Michigan and Superior to the magnetic north pole. Compasses used along that line require no variation, but the line is moving west along with the pole, leading to runway closures for renumbering. Florida?s airports aren?t alone. Officials at England?s Manchester International Airport (MAN), one of the 20-busiest in the world, changed their assignments in 2009 from 6L/24R to 5L/23R. Stansted Airport (STN) near London did likewise in the same year, although Trevor Waldock, head of Stansted airside operations, noted, ?It?ll be roughly another 56 years before we have to consider changing it again.? The compass rose on any navigation chart shows the annual variation for the area of that chart but, since the FAA republishes aeronautical charts every 56 days, the movement of magnetic north is of more compelling interest to the press than to pilots. Complicating the issue are airports, such as Los Angeles International (LAX) with four parallel runways. Two are already designated 24L and 24R because they have a 240-degree magnetic heading, while the other two parallel runways bear 25L and 25R designations. Even more confusing: some airports in the far north don?t use magnetic headings for their runways at all. At Resolute Bay Airport (YRB) in Canada, the runways are 17T/35T because they are marked using true bearings, not magnetic ones. The variation there is more than 30-degrees west. The good news? Modern aircraft GPS systems don?t rely on magnetic poles to determine their directions.